Also available for DC/DS-16, difference is 2 counters instead of 5. All functions are the same. Have you ever wondered how many times some event or function is used in a model? Do you have a maintenance interval of 50 events on for example retracts? Well, let’s keep track on them! In short: Copy the .lc (or .lua, the .lc is memory-optimized) file from github here to your transmitters Apps-folder, if there is a translation file copy the .jsn file to Apps/Lang-folder on your transmitter. Head on to “Applications” -> “User applications” and add the app. Guide on installation of Lua-apps available here if you need some more in-depth guide. Rules of usage are simple. 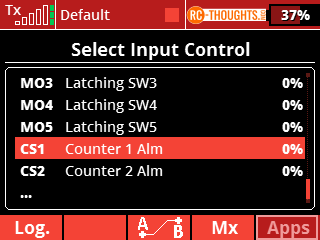 Select a switch (any physical, logical etc) for a counter. Every time this switch is ON the counter-number is increased with one. You can also adjust the value of “Current count” manually if you need to. Counters 1 and two are multi-function counters. 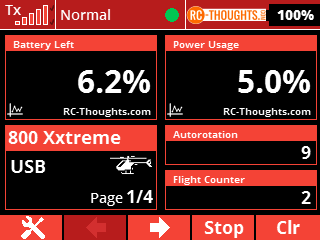 Both have their own telemetry-window you can put on your main screen and both have own alarms. Simply adjust the alarm-value to for example 10 and make a sound on event to use the switch “Counter 1 Alm” to activate a desired sound-file. When value of counter goes to (in this case) 10 the switch gets activated. 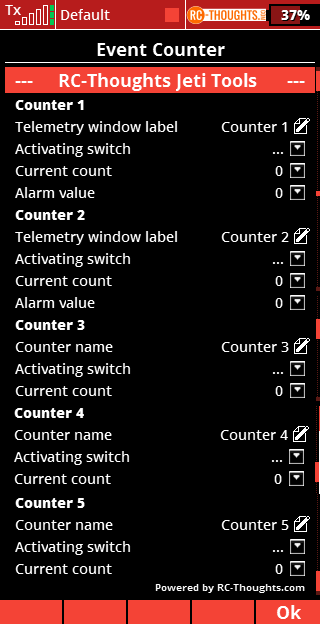 Switch is deactivated when counter is below alarm-value again either bu raising the alarm-value or lowering the counter-value. Both are adjustable by user. If alarm-value is set to zero the alarm-function is disabled. That’s how easy that is! The amount of counters are stored in persistent memory every time they change, this means when you restart your transmitter etc the values are there. 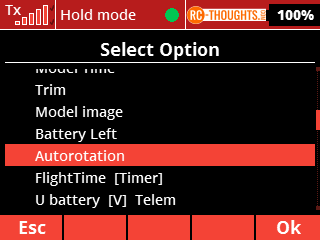 They are not reset when powering off the model for example. Values are stored per model. If you have need to alter the event-count for specific counter this is possible from the application. Some rules do of course apply! Never use LUA to control a function that would take the model down if misbehaving! Always, always test the function thoroughly! If you do not know, then don’t! Applications are free to use (MIT-license) and linking to this page is encouraged! Send a small donation to help keep RC-Thoughts ad-free and Tero with enough coffee he needs! Phoenix Sim downloads are available HERE! VBar NEO – what’s new?